Sean preparing a barrel as I arrived. This past Saturday I had the opportunity to visit with two-thirds of Heritage Brewing, a new microbrewery just outside of historic downtown Manassas, VA. The company (which also happens to be two-thirds veteran owned) isn’t quite ready for full time brewing at the moment, but they are working with a couple of restaurants that not only give them the chance to fine-tune their recipes, but also push the trio to their limits with requests using ingredients such as rhubarb or a combination of tomato, basil and fennel. There’s a 20 barrel system slated for installation this September that will support the brewery’s main line of products allowing them to use their smaller, pilot setup for experiments and one-offs. As soon as I pulled into the parking lot that Heritage Brewing shares with a few other business, I knew I was in the right place. 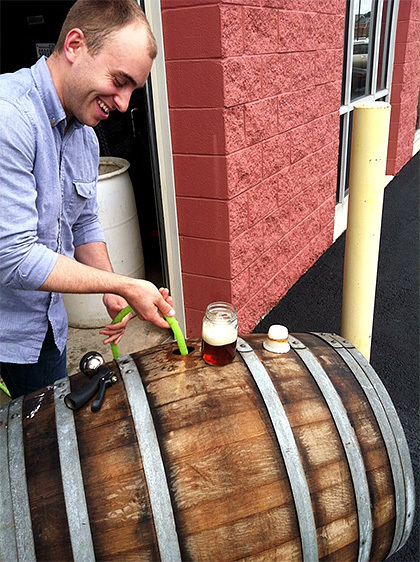 Sean, pictured above, was at work re-hydrating a chardonnay barrel they had recently procured from a local winery. The plan for this particular barrel was to house a Saison that was awaiting its new home patiently. There was no doubt that I was going to like talking to these guys. It’s the main system now, but will soon be dedicated to experimental one-offs. Both Sean and head brewer, Julian, spent the next hour and half treating me to several of their tasty brews (notes below) as well as their plans for the future. Sustainability and employment of local assets are high on the group’s list for when they open shop this December. Spent mash and trub are already being sent to a local farm for feed and there’s an established relationship with a winery for future barrel-aged brews. And for their bourbon-y needs they are also in talks with a local distillery. As great as all this sounds, goals like these are not always easy to accomplish. But after listening to both Sean and Julian, I got the feeling that, through their DIY work ethic and level-headed approach to the future, these guys will most certainly be able to get rolling. The Manassas area is just begging for the infectious enthusiasm and drive that these guys have. From left to right: American Expedition, empty Revolution, King’s Mountain and The Teddy (I think). The Teddy: An American IPA in an east-coast style. It’s a bit more malt forward, but still has a welcome bit of earthy, leafy hop character and a dense, resilient head that will leave you with your own Teddy Roosevelt ‘stache. 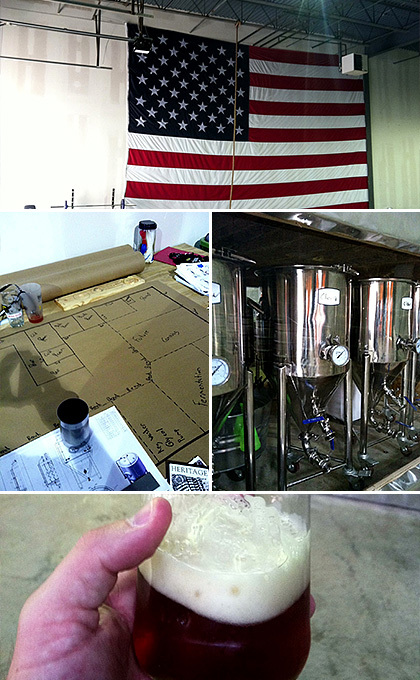 Revolution: A lighter bodied amber ale that the brewery hopes to have certified organic. It’s brewed with locally grown oranges that give the beer a light hint of citrus peel. King’s Mountain: A scotch ale brewed with brown sugar that was rich, malty and quite drinkable. Ironsides: This will be the brewery’s session ale. It wasn’t quite ready for me to check out, but the beer will weigh in at 4.8% ABV. American Expedition: This is the company’s Summer seasonal. It’s a refreshing wheat ale that carries a welcome bit of earthy honey and a hint of ginger. For the Fall and Winter the company plans on releasing a pumpkin ale brewed with bourbon-infused cinnamon sticks and a spiced winter ale. 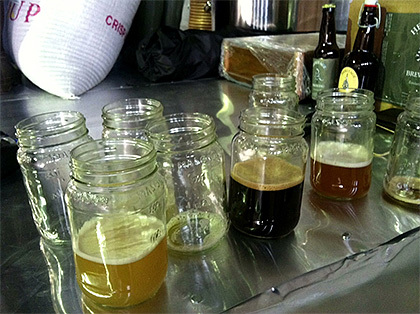 As stated above the guys plan to support their experimental brewing habit with a stable of year-round releases. I was lucky enough to try one of their happy accidents. Ferguson’s Revenge is based off of their Scotch Ale but is brewed with an equal amount of wheat and then has a small measure of muscat grape wine added in second fermentation. The end result is an incredibly refreshing beer that, despite its roughly 14% ABV, was dangerously quaffable. Expect this beer as is and as a barrel-aged version. I thoroughly enjoyed speaking with both Julian and Sean. They are a pair of down-to-earth guys that really get into their work from the ground up. It sounds to me as though they’ve got a solid plan laid out for the brewery. Thanks again to Heritage Brewing for the invite to come on out and have the opportunity to get to know them. I’ll be stopping by again in the not too distant future. 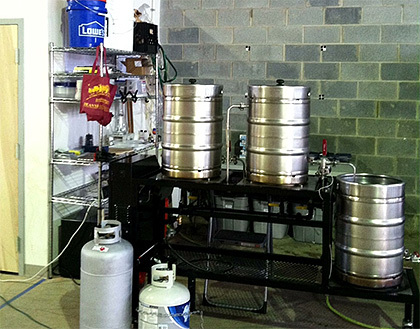 Share "Heritage Brewing, Manassas, VA"